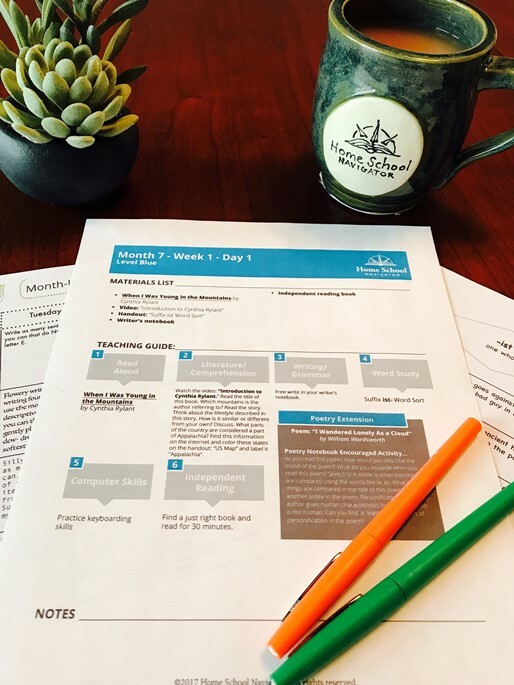 I was so excited to get a chance to review a 1-year subscription to Home School Navigator, complete with an interactive notebook to help make this course fantastic! 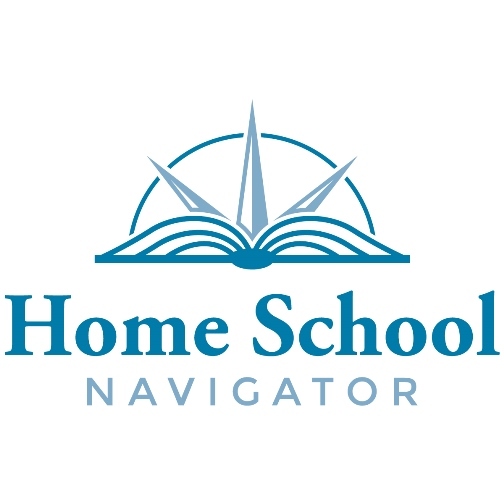 Home School Navigator is your one stop shop for reading, language arts, grammar, writing, and vocabulary. Everything is planned and organized for your convenience. Ashley and Beth (the originators) have really put out a great product here that is easy to use, and covers multiple areas. Homeschool Navigator includes read alouds, worksheets, games, and more. Our Experience I was really excited to get started with this. Mr. B and reading aren't exactly friends. He LOVES being read to, and he doesn't mind reading homework. He LOVES reading what he wants to read, but not necessarily what I want him to read. Thus the love/hate relationship. I'm always after a good reading curriculum that will work for him, and that also targets language arts skills, too. I am always a little skeptical when it comes to anything reading, but I had no reason to be with Home School Navigator. We got to experience and try out a few different levels, and I ultimately chose the BLUE Level as his "official" level. So we started on the first level of the level Blue. The read aloud book is Goldilocks and the Three Dinosaurs. Ok...so now you're probably thinking the same thought I had. WHAT?! That's WAY below his level! And you're right, it is. That's when I found out it is intentional. The reading level IS lower (about a 4th grade level) so that the student can focus on the concept, and not the reading. THIS IS PERFECT FOR MR. B! He doesn't have to worry about the story so much as what is being taught by the story-such as compare/contrast as this particular section was teaching. On top of the that, this story is just right down funny! I knew we had a winner when he had hit replay for the 4th time, and the giggles never stopped. There are also what I like to call "teaching videos" that really benefit Mr. B because he is more apt to pay attention to someone else, rather than me, at times. The teacher's guides are so handy! Everything is planned out by the week and day. I like to print a month at a time, and go from there. It's nice to just check things off, and know I have that to keep in our records for his end of the year portfolio review. I also give the daily print off to Mr. B. This way he has a visual of what he has to do, and he can easily mark through what he has completed. He doesn't even have to ask what to do first, because they are numbered for him already. This is great for kids on the spectrum who need that little nudge to know what to do, and when. The printable worksheets are really great. I'm not going to show a screen snip of everything included for one week, but these should give you a pretty good idea. This is a full on curriculum, and really everything you need for the whole year. The font is easy to read, and I like that there's not a lot of distractions. I also like how each page features the level number (B 1.1.5 for example) so you know what worksheet goes with what day/week! There are books that go along with this. We are reading "Holes" right now. But the books are easily found at the library if you don't already have them. Overall, I can't be happier! Mr. B will willingly do his reading work, I can get a few things done around the house since I don't have to hover over top of him and keep him on task, and he really enjoys it, too. He's learning a lot! I HIGHLY recommend this to others! Does Home School Navigator Pass My 4 Ingredient Test? You can work at your own pace, however the plan is a 9 month school year. You are bound by your subscription time limits. You can skip ahead, or repeat, as needed. There are no hidden fees, but you are responsible for acquiring the books for each part. You do not have to have the read aloud books, as those are on video for you. The books are easily found at the library. Home School Navigator does cover multiple age. Mr. B is 12, and we were working on the Blue Level. You are locked into your level. I'm not sure how difficult it is to change levels if needed. Mr. B loves it. He usually wanted to work ahead! I think this is VERY special needs friendly! This would cover reading and language arts. Please check out the Homeschool Review Crew for more reviews.